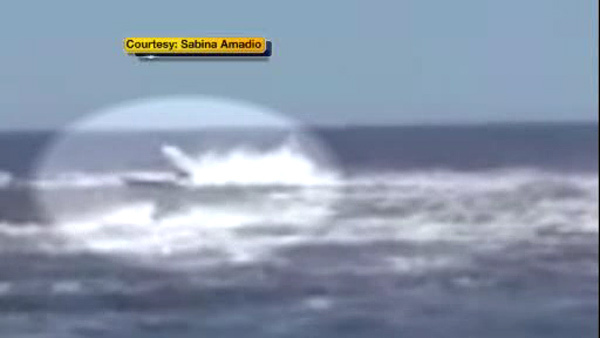 What caused the deadly speedboat crash at the Jersey Shore? POINT PLEASANT BEACH, N.J. (WPVI) -- Investigators are trying to figure out what caused two boats to collide during a race at the Jersey Shore that killed one person and injured another. The deadly speedboat crash happened Sunday afternoon during the Grand Prix race off Point Pleasant Beach. David Raabe, 38, of Forked River was killed in the crash. His teammate on the boat, 35-year-old James Byrne of Nutley, was critically injured. "The last boat kind of went right into the second to last boat. The two men were ejected and then all of a sudden it was gone," witness Doreen Lobue said. Authorities say for unknown reasons, during one of the races, their boat, named Repeat Offender, turned and crossed into the path of another boat named Smith Brothers. "One of the boats was in the air because of rough water and when it came down, it came down on the other boat," Point Pleasant Mayor Stephen Reid said. Brothers Richard Smith of Souderton and Peter Smith of Riverton were ejected from their boat, which then sank. They were not seriously injured. Racers say conditions Sunday were difficult. "The guy that was running the throttles on our boat said he hasn't seen waters like this since 2004," boat driver Randy Clayton said. David Raabe was the father of three and an experienced racer. His family in Forked River declined to comment. Attempts to reach the Smith brothers were unsuccessful. The boat Repeat Offender has been wrapped up in tarp and will be examined by investigators. "Was it operator error? Was it ocean conditions? It's very easy hitting those speeds to lose control. Could it have been something mechanical?" Al Della Fave of the Ocean County Prosecutor's Office said. All of those things will be looked at along with interviews with the survivors. The Coast Guard says the Smith brothers' boat is still at the bottom of the ocean, but is not a navigation hazard.